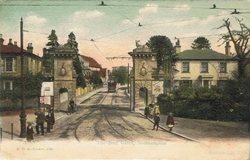 Formerly standing at the junction of Lodge Road and the Avenue in Southampton, the gates once formed the entrance to Bevois Mount, a large estate which stretched the the banks of the Itchen. in 1833 the estate was acquired by William Betts, builder of the Royal Pier who gradually it off during the latter part of the 19th century, the suburb of Portswood now stands in its place. Bevois Mount House itself survived until after the First World War. The gates themselves remained until 1919 when they were demolished shortly after being gifted to the town. as seems to be so often the case with Southampton they were deemed a traffic hazard. Some of the rubble was used to form rockerys and paths in the towns parks. The fate of the stags themselves is more mysterious. It seems likely that they were removed by an angry William Burrough Hill, the disguntled donator, and buried in the gardens of his house in Regent's Park. In the 1960's a large piece of stone thought to be part of a stag's neck was dug up in the garden of a house in Regent's Park, the house having been constructed on the site of Burrough Hill's house there. It could be that there are more parts of the stags waiting to be discovered there. The gateway originally had fine wrought iron gates shutting it off from the Avenue. Later these were acquired by the local authority and moved to form the entrance to the Old Cemetery on the Common.